If we were in need, we’d likely want money. So what accounts for that difference? Let’s say you are a policymaker who wants to fight the obesity epidemic. Should you give people the tools to make better decisions, such as listing calorie counts on menus? Or should you ban certain types of junk food altogether, perhaps forbidding the sale of jumbo-sized sugary sodas? Banning junk food probably feels like it will have more of an impact. But now take the perspective of a regular citizen. Would you still prefer to have your drink choices dictated to you? This demonstrates a common phenomenon: when people are on the receiving end of help, they tend to prefer something called agentic aid, which allows them to choose how to respond, says Adam Waytz, an associate professor of management and organizations at Kellogg. Yet people often prefer the opposite—paternalistic policies—when helping others. New research by Waytz and colleagues suggests a possible explanation for both behaviors. Interestingly, his team also found the reverse: participants thought that people who received paternalistic aid are less mentally capable. The finding suggests that giving this type of help, such as offering food instead of money to the poor, may hurt the recipients’ public image. Previous research suggests that giving cash directly to the poor is an effective way to improve their well-being. “People seem to know what to do with their money,” Waytz says. For instance, recipients might need funds to start a business more than they need the food or job training offered by a charity. But charities often give paternalistic aid, partly because it is the status quo. Donors also may fear that recipients will spend money frivolously. “We don’t necessarily trust the people who are in poverty to get themselves out,” Waytz says. On the flip side, people may not like receiving paternalistic aid because they feel it threatens their personal freedom or harms their self-esteem. Waytz and his collaborators, Juliana Schroeder of the University of California, Berkeley, and Nicholas Epley of the University of Chicago, wondered if people’s beliefs about the recipients’ mental capacity also might explain these tendencies. The researchers conducted an online study with 100 people through Amazon Mechanical Turk. Participants read about the real agentic charity GiveDirectly, which gives money to poor people in Kenya and Uganda. Participants then rated the charity’s effectiveness, as well as elements of the recipients’ mental capacity, such as their self-restraint and ability to plan. Finally, participants received 25 cents and could choose to donate some or all of it to GiveDirectly or to the Red Cross, which provides more paternalistic aid. Participants keep any money they chose not to donate. The participants’ view of recipients’ mental capability made a difference. When people gave the recipients higher scores for mental capability, they tended to think that GiveDirectly would do a better job of helping the poor. They also gave more money to that charity. Another study found that making the recipients seem more capable boosts people’s support for agentic aid. In this online study, participants read about GiveDirectly’s aid to an anonymized African country dubbed Nia. One group read statistics about Nians stated in a way that emphasized their lack of mental capacity, for example, that 14 percent are illiterate. The other group read the same information stated in a way that emphasized their mental capacity, for example, that 86 percent of Nians are literate. People in the second group rated GiveDirectly’s effectiveness about one point higher (on a seven-point scale) than those in the first group. They also donated more money to GiveDirectly than to the Red Cross, while participants who read the negative descriptions did the opposite. Next, the researchers explored people’s support for paternalistic policies when applied to themselves versus others. People might assume, “I can think for myself, I have good self-control,” Waytz says. But they might perceive others as mentally weaker, and deem a paternalistic policy a better fit. To explore this, the team divided online study participants into two groups. One group was told to imagine that their governor was considering legislation on issues such as credit card debt, while the other group was asked to pretend they were the governor of Ohio and needed to decide which policies would most benefit residents. Participants had to choose between paternalistic measures, such as imposing maximum credit limits, and agentic measures, such as offering information about payment penalties. The first group, which imagined they would be the recipients of new policies, supported the paternalistic option on average 1.77 times out of five. But the second group, which was acting as policymaker, picked that option 2.36 times out of five. Yet, despite our rosiest visions of ourselves, our self-restraint does fail sometimes. So the team pounced on study participants at a vulnerable moment: Thanksgiving. The researchers sent a survey to 100 participants a couple days before Thanksgiving; another 98 people received it Thanksgiving night. Recipients answered questions about the effectiveness of paternalistic and agentic policies to promote healthy eating, such as making restaurant portion sizes smaller versus running ads about the issue. Not surprisingly, the participants’ average rating of their mental strength dropped from 4.55 out of 7 before Thanksgiving to 4.17 afterward. At the same time, the estimates of paternalistic policies’ effectiveness rose from 3.50 to 3.99. In other words, the post-holiday group was more willing to admit, “Okay, yeah, I guess paternalistic policies are somewhat useful, even for me,” Waytz says. So if a manager wants to enforce strict workplace rules—say, blocking social-media websites—they might succeed if such measures are suggested the day after people have been glued to their Facebook and Twitter feeds during a news scandal. What about the reverse? Does the type of aid that people receive affect how others perceive their mental capacity? An online experiment suggests it does. If participants learned that an organization had provided refugees with food or shelter, rather than cash, they believed the refugees were mentally weaker. And they thought recipients were more likely to waste money on drugs and alcohol. When charities offer people paternalistic help, others “are going to infer that those people don’t know how to think for themselves,” Waytz says. Thus, organizations could make a dent in the stigma surrounding the poor by giving agentic aid. The study does not tell us whether one form of aid is always better. It depends on the situation, Waytz says. For instance, default enrollment in company retirement plans—a paternalistic tactic—tends to result in higher participation. But research about the poor suggests that “the best way to help someone in need is just give them money and get out of the way,” he says. So are people overestimating their own mental abilities or underestimating others’? Both likely play a role, Waytz says, but the latter effect may be stronger because people do not know much about others’ efforts to plan ahead and make considered decisions. Is it true that your typical homeless person is just a drunk, living off of handouts and drinking to oblivion each night? When I started working with homeless persons 20 years ago, we often explained that the average homeless person wasn’t that at all. It was a fourth grader. Homeless persons have failed to pull their own weight, failed to meet society’s requirements, failed society altogether. Right? Or maybe, society has failed them. We’ve always had homeless people in America. For centuries. It’s just part of our civilization, right? No. Homelessness as a prevalent problem began around 40 years ago, when the “Community Mental Health” movement began and many thousands of patients were released from our substandard mental hospitals onto the streets to fend for themselves. Soon larger groups of the unemployed, the unhealthy, substance abusers and others joined the tide, and “street people” became a common sight in our urban and non-urban areas. Over-strapped, Spartan “shelters” were set up, warehousing humans who just couldn’t cut it. The attitude was that they should pick themselves up by their bootstraps and get a job. Find a house. Rejoin society. But this is very hard to do when you’re hungry, or poor, or tired. Or if you’re a crime victim or a domestic violence victim. Or if you’re unskilled, or sick, or mentally ill, or on probation. And there is rarely a helping hand to get you back on your feet. Few resources. And some in society may like to assuage any responsibility for the situation with the old saw that this is what people want. But no one wants to be homeless. It’s a violent, frightening, life-threatening, painful and uncomfortable existence—especially in the Keys. Imagine walking a mile or more to use the bathroom, walking everywhere in the blistering sun, with insect bites and loss of dignity to punctuate your day. There is little support for health or comfort. And tomorrow might just be the same. The Services First approach used for decades argued that the very limited resources wouldn’t be effective until a person had totally stopped drinking and taking drugs. Giving people assistance just made them dependent. Members of general society with no experience with homelessness and their particular list of problems just knew that “these people” won’t “get well” until they learn to provide for themselves and become self-sufficient. But overcoming personal demons, getting back to health, obtaining necessary skills or escaping predators can be nearly impossible for most people while living on the street or in an institutional setting. Services First has become increasingly expensive, ineffective and sometimes even exacerbates the problem. We know the obvious cure for homelessness. The cure has a 100% effective rate. It’s housing. That’s the good news. The better news is that housing someone first, and following up with needed services, called Housing First, is cheaper, more effective, and works right away! It is the industry’s best practice and works 90% or more of the time according to studies. It lowers the populations in the jails, courts and the emergency rooms. It helps clean the city streets and the residential neighborhoods. It lowers homelessness. And it is the humane way for a caring society to proceed. It’s a hand up, not a handout. The Southernmost Homeless Assistance League has operated the homeless shelter on Stock Island for over 6 years with a small staff that works to address homelessness one client at a time. SHAL case managers work hard to get clients healthcare, employment, identity documents, and counseling. The shelter staff works hard to provide a clean, safe, overnight rest; a hot shower; and a couple hot meals a day. And if the Keys turn out to be an unsustainable place for someone to become self-sufficient, SHAL sometimes works to provide a bus ticket to a better location. SHAL is a nonprofit and accepts donations of items (clothing, washers & dryers) and clothing and cash to support our clients’ needs that may be tax deductible. And while the majority of Shelter residents are very short-term, we do work very hard and cost effectively with hundreds of clients each year to get them the hand up they need. Because no one wants to be homeless. John Miller is Executive Director of the Southernmost Homeless Assistance League, which operates the Keys Overnight Temporary Shelter on Stock Island. After a career in business management, John Miller has been running nonprofits for the past 20 years, with a focus on housing and homelessness. 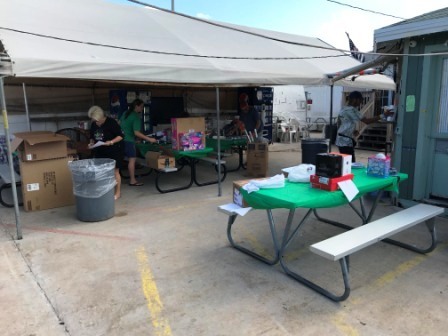 On Tuesday December 19th, the Southernmost Homeless Assistance League hosted an “Elf Day” at the homeless shelter on Stock Island. Deputy Executive Director Elicia Pintabona partnered with Hervé Thomas of the Monroe County Firefighters Benevolent Association to wrap donated toys that were collected for Operation Irma Big Pine Key Santa Claus. The idea originated from the Irma Big Pine Key Facebook page which was created on September 10th of this year by Monroe County Firefighter Hervé Thomas. This page was created strictly for hurricane and recovery efforts related to Big Pine Key and adjacent islands. 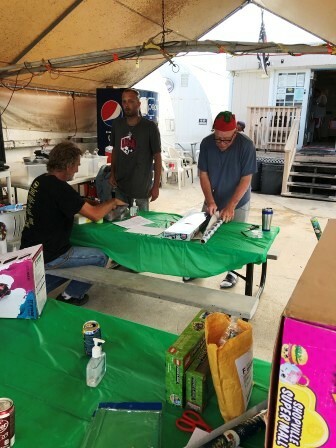 In response to a growing number of people asking if something was going to be done for the kids, operation Irma Big Pine Key Santa Claus was originally intended to deliver toys to a few family who had been severely hit by Irma (lost houses, etc). The original plan was to serve 6 or 7 kids. A fund raiser was organized on the Facebook page by Mr. Thomas, and after a great response from the public, the reach of the project progressively grew from the original 3 families to 11 families, and from 6 children to 32 children!!! Elicia Pintabona saw an opportunity to help and offered the services of the SHAL staff and clients to wrap the donated gifts during an “Elf Day”. Present at Elf Day were Deputy Executive Director Elicia Pintabona, Case Managers Amy Yancich and Teresa Wallace, and Lead Monitor Chris Sparrow, along with over half a dozen clients that came to volunteer. “Irma Big Pine Key Santa Delivery Tour” will be done aboard the “Santa’s Express” – a Monroe County Fire Rescue Engine specially assigned to this exceptional detail by Deputy Chief Steve Hudson. The Fire Engine will be driven and manned by Volunteers from the Monroe County Firefighters Benevolent Association, which was pivotal in the organization of this operation. Special thanks to Fire Chief Jim Callahan, Deputy Chief Steve Hudson, Battalion Chief David Sebben, Captain Andrea Thompson, Lieutenant Carlos Javier, Firefighters Hervé Thomas and Mary Napoli, and Volunteers Firefighters Sean Hemphill and Tim Farley. SHAL would like to wish everyone a happy and healthy Holiday Season!!!! Keys Strong! Santa Claus will trade in his sleigh for a fire engine this weekend to surprise 32 Big Pine Key children hit hardest by Hurricane Irma. Members of the Monroe County Firefighters Benevolent Association will visit 11 families, nominated by the community, on Friday and Saturday, surprising the children with gifts they asked for from Santa, according to organizer Herve Thomas. Firefighters will visit the houses first under the guise of a routine check, talking to the kids and asking them their names. Once identified, they will radio to Santa in the truck, who will bring the gifts. “It’s going to be a riot,” Thomas said. Toys, bikes and scooters are among the gifts, which also include a mini- recliner requested by a child who wants to relax like his dad, Thomas said. The idea for the giveaway began on the Irma Big Pine Key Facebook page, which Thomas set up shortly after the storm to give residents a place to connect. About a month ago, a Christmas discussion started and Thomas decided to organize a giveaway. “It was so obvious that I just formulated what everyone was thinking,” he said. Thomas asked the community to nominate the children of three families hit the hardest, but response was so great the number quickly grew to 12 families and 32 children. Over 60 donors responded, with several offering to sponsor an entire family. 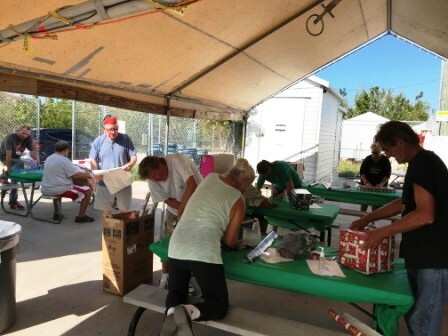 Bucktooth Rooster restaurant will provide a Christmas cake and meeting spot for several families who are staying outside Big Pine due to home loss from Irma and the Southernmost Homeless Assistance League wrapped the presents with help from clients. 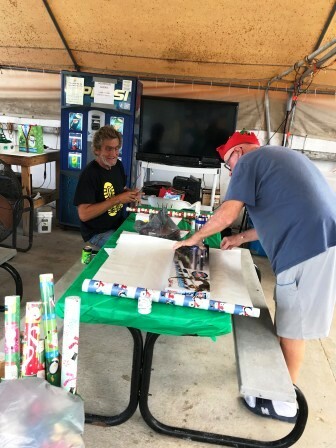 Although Keys Overnight Temporary Shelter resident William Messick hadn’t wrapped a present in many years, he said it was like riding a bike and was happy to provide assistance. SHAL Deputy Executive Director Elicia Pintabona saw the discussion on Facebook and looked for a way to help, she said. “It was huge man, incredible input from the people,” he said. 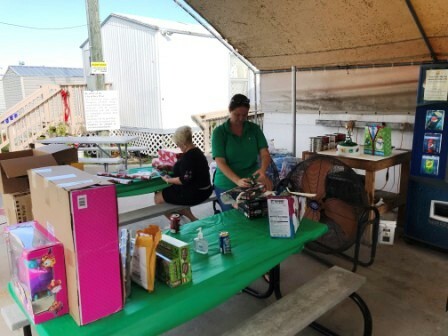 On Tuesday December 19th, the Southernmost Homeless Assistance League hosted an “Elf Day” at the homeless shelter on Stock Island. Deputy Executive Director Elicia Pintabona partnered with Hervé Thomas of the Monroe County Firefighters Benevolent Association to wrap donated toys that were collected for Operation Irma Big Pine Key Santa Claus. The original plan was to serve 6 or 7 kids. A fund raiser was organized on the Facebook page by Mr. Thomas, and after a great response from the public, the reach of the project progressively grew from the original 3 families to 11 families, and from 6 children to 32 children!!! 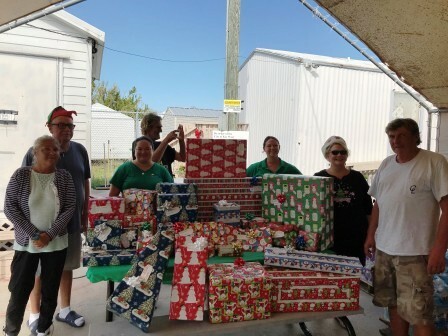 Elicia Pintabona saw an opportunity to help and offered the services of the SHAL staff and clients to wrap the donated gifts during an “Elf Day”. Present at Elf Day were Deputy Executive Director Elicia Pintabona, Case Managers Amy Yancich and Teresa Wallace, and Lead Monitor Chris Sparrow, along with over half a dozen clients that came to volunteer. 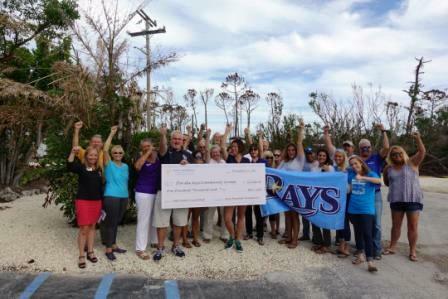 On Monday November 13th, the Tampa Bay Rays Baseball Foundation was pleased to present various community groups in the Florida Keys with grants totaling $100,000. The grants will be used to support the Florida Keys and the non-profits that serve them. 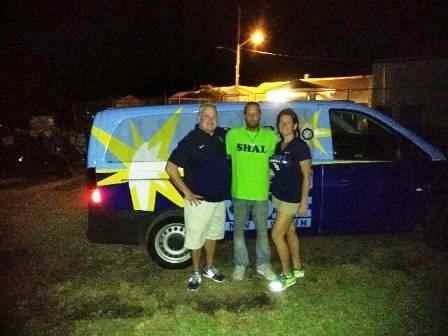 In addition to the grant that was awarded to SHAL, the Rays Baseball Foundation dropped off various supplies to the homeless shelter which were immediately put to good use by Chris Sparrow and his staff. 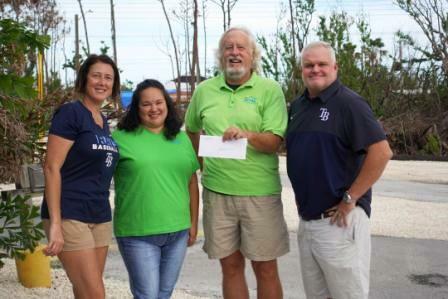 We would like to express our sincere gratitude and appreciation to the Tampa Bay Rays Baseball Foundation for their generous support! 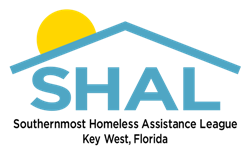 Editor’s note: SHAL is slated to present its annual audit and its response to the allegations described here at the City Commission meeting on Tuesday, December 5th, 2017. Despite claims of fraud and unsanitary conditions at the Stock Island homeless shelter made by the fired former manager of the facility, Key West City Commissioners voted 5-2 on Nov. 8 not to investigate the charges. Commissioner Sam Kaufman, who has complained about management at the Keys Overnight Temporary Shelter (KOTS) in the past, proposed that City Manager Jim Scholl investigate claims made by Mike Tolbert, the former KOTS director who was fired in September for reopening KOTS after Hurricane Irma without the approval of shelter operator Southernmost Homeless Assistance League (SHAL). Tolbert, who has worked at the shelter for the past four years, then wrote a blistering letter to Kaufman and Scholl accusing SHAL Executive Director John Miller of multiple issues, including mismanaging money allocated to purchase bus tickets for homeless residents to leave the island, unsanitary food preparation areas and unhealthy living conditions for residents. Tolbert said he had seen 17 cases of scabies, a painful, contagious skin condition, at KOTS before he was fired. “Those mattresses, you wouldn’t let your dog sleep on. They’re torn up. They’re trashed,” Tolbert told commissioners. “The allegations are very serious. We’ve known for some time that there have been issues with the operator of our homeless shelter,” Kaufman said, adding that the city needs to “consider alternatives” to SHAL managing the facility. But he was unable to convince his colleagues to take up Tolbert’s claims against SHAL. While Commissioner Billy Wardlow said he might consider an investigation, the fact that Tolbert came forward with his complaints only after he was fired was suspicious. “I think Mr. Tolbert should have brought this up four years ago when he was working there instead of after he got fired,” Wardlow said. And Commissioner Margaret Romero said that the city did not have the expertise to investigate fraud complaints. If there is suspicious of fraud, it should be raised with the Florida State Attorney’s office, she said, adding that the Monroe County Health Department should investigate any health complaints. “At this point, for us to jump in and investigate fraud or health conditions or other things, I think that is out of our realm,” Romero said. City Manager Scholl said he has “had discussions” with SHAL in the past about its management of KOTS. SHAL is currently undergoing an accounting audit and Scholl will forward a written report from the SHAL board of directors to commissioners when the audit is completed. “If that’s not sufficient, then we’ll see what the next step needs to be,” Scholl said. But Kaufman was not satisfied. “If the allegations are untrue and if they are clearly meritless, why is there resistance to having an investigation,” he asked. SHAL said it serviced 286 homeless clients in October, with an average 73 people a night sleeping in the shelter. Bayshore Manor, Monroe County’s assisted-living home for 16 residents, needs to be turned into Key West’s overnight homeless shelter, the city’s mayor said this week. The elderly residents could move into the Key West Housing Authority’s senior living complex, which will house at least 100, when it opens next year, Mayor Craig Cates said. A 2011 lawsuit by condo owners is forcing the city to move its Keys Overnight Temporary Shelter from the present-day spot next door to the Sheriff’s Office on College Road. For years, Key West city commissioners had always chosen a former Easter Seals site, also on College Road, as the place for its next homeless shelter. . But Cates says the Easter Seals location is now needed for new affordable workforce housing. This week, city commissioners approved a zoning change specifically for its properties on College Road, which total 2.65 acres. “We could have 106 units there,” Cates said. Bayshore Manor, which costs the county about $800,000 a year to run, is an old facility, Cates said. Its residents could move into a new state-of-the-art complex on Duck Avenue in Key West and Bayshore Manor employes could find other county jobs, he said. County Commissioner Sylvia Murphy said no way. As for the Keys Overnight Temporary Shelter in Key West, Murphy said it remains a city, not county, issue. “KOTS is Key West’s problem, it’s not ours,” she said. The idea of converting Bayshore Manor into an overnight homeless shelter received a lukewarm reception at Wednesday’s Monroe County Commission meeting but County Mayor George Neugent will bring back the idea back next month. Neugent, Key West Mayor Craig Cates and County Administrator Roman Gastesi met last week to discuss possible locations for KOTS (Keys Overnight Shelter). The three discussed moving the 16 Bayshore Manor residents and 10 respite care beds to the new senior assisted living facility the city is building at Poinciana Plaza, which will be open within the next six to eight months. Bayshore would then serve as the homeless shelter. However, county commissioners Sylvia Murphy, Heather Carruthers and Danny Kolhage did not embrace the idea on Wednesday. The County Commission voted last month to give the city a year to move KOTS from its current location on county-owned property next to the sheriff’s headquarters and jail. Cates wants KOTS to stay there, despite the city’s promise to move it several years ago. Sheriff Rick Ramsay plans to build worker housing for his employees there. The disagreement sparked the informal meeting between city and county leaders. Neugent reminded his fellow commissioners to play nice with the city because the property is within city limits and the city will ultimately have to approve Ramsay’s project and issue the building permits. Nuegent told The Citizen Thursday morning that he would rather see Kolhage and Carruthers take the lead on this issue, as they represent Key West. However, he said he would put the item back on the November meeting agenda if they don’t. Key West Mayor Craig Cates admits he probably “jumped the gun” a bit when he publicly spoke recently about converting the Bayshore Manor senior assisted living facility into the local homeless shelter. The talks between city officials and Monroe County, which owns and operates Bayshore Manor, up to that point had been preliminary and unofficial. But after mentioning the idea in a radio interview, a lot of people got very interested, and anxious, very quickly, including Bayshore staff members and relatives of the facility’s current residents. And when county commissioners discussed the idea at their Oct. 18 meeting, their initial response was not very enthusiastic despite agreeing to bring the matter up again at their November meeting. Currently, Monroe County supplies the land for the existing Keys Overnight Temporary Shelter (KOTS) while Key West pays about $450,000 each year to operate the shelter. But Monroe County Sheriff Rick Ramsey wants the shelter property, which is next to the sheriff’s headquarters, to be used for affordable workforce housing for his deputies and staff. And county commissioners voted in September to give Key West one year to move the shelter to a new location. The city commission had agreed in 2015 to move KOTS across the street to one of three city-owned parcels on College Road on Stock Island. But with the already-low availability of affordable housing units becoming almost non-existent after Hurricane Irma ravaged the Florida Keys in September, Cates wants all three of the parcels to be used for a workforce housing development. And that would leave the issue of where to relocate KOTS up in the air. While there has been talk in the past about the city taking over Bayshore Manor, there has been no place to move the 16 current residents, as well as 10 addition beds that are used for respite care. But with the imminent completion of Poinciana Gardens, a new 108-unit senior living facility the city is building on Duck Avenue, there will soon be a modern facility that can house the Bayshore Manor residents, Cates said. Under his plan, the county would lease the one-acre Bayshore Manor complex to the city, the city would pay the cost of converting the building into a homeless shelter, and both the city and county would share the cost of maintaining KOTS going forward. As for the cost of operating Poinciana Gardens, the city has hired a private contractor to set and collect rent from occupants that is intended to cover the cost of operating the facility. Monroe County spends approximately $800,000 a year to operate Bayshore Manor. The new Poinciana Gardens, aimed at low and moderate-income seniors, is expected to open in six to nine months. Located at Duck Avenue and 17th Street, the three-story structure replaced a four-unit apartment building on the property and will provide 108 apartments for an estimated 140 people. The first two floors will have 60 apartments for more independent seniors, with the third floor offering 48 units with assisted living services, which include more care and supervision for residents. In addition, the new facility will have a “respite care” program, where 25 non-resident seniors can receive daycare during the day.